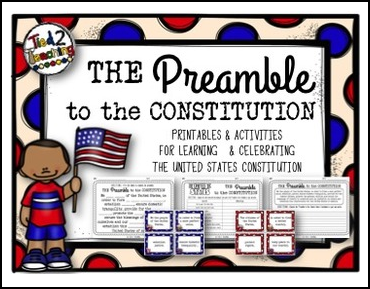 Constitution Preamble comes with a several printables and activities for you to use as you teach your kids about the United States Constitution. In the free Constitution Preamble pack, you will receive the following great resources. This activity come with 16 cards that can be used for sequencing or a memory match game. 8 of the cards (blue) come with one quote each from the US Constitution Preamble. The other 8 corresponding cards (red) each have a matching explanation for each of the blue card preamble quotes. I hope this comes of use to you as you teach your kids about our country and the critical document that is the US Constitution.